GFA boys basketball player Greg Lawrence, second from left, a resident of Fairfield, was honored for scoring the 1,000th point of his career during Friday’s game against Redemption Christian Academy. 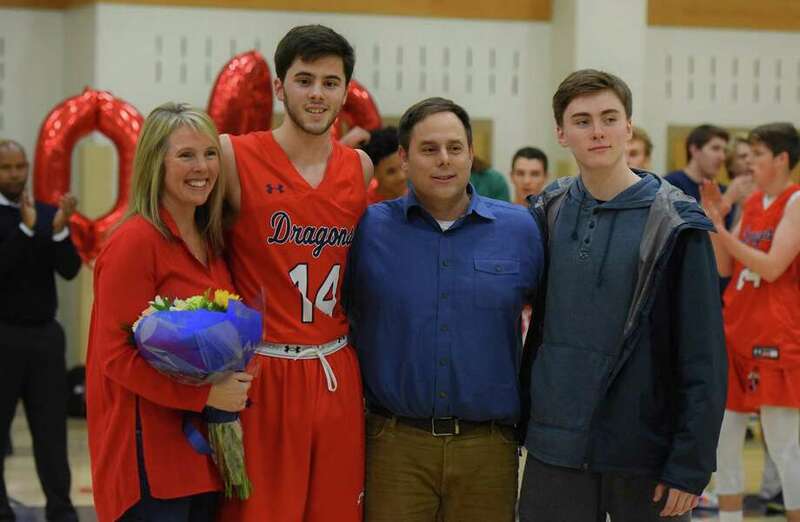 It was a special week on the campus of Greens Farms Academy as the Dragons went 3-1 during their annual Pack the House Night, won four FAA wrestling championships and had their third 1,000-point scorer of the winter season. Greg Lawrence (Fairfield) poured in 30 points, including the 1,000th of his career, as GFA wrapped up Pack the House Night with a 70-63 win over Redemption Christian Academy on Friday. Cole Prowitt-Smith (Fairfield) added 23 points to the winning effort while TJ Holloway (Orange) added 13 and David Basich (Westport) 11. Lawrence also had six rebounds and seven blocks on the night. Prowitt-Smith had six rebounds and four assists while Jack Seegers (Stamford) had a team-high seven rebounds. Earlier in the week, a balanced scoring effort helped carry the Dragons to their seventh straight win, and their first win at home since Dec. 18, with Wednesday’s 68-50 win over Masters. Holloway and Lawrence scored 15 points each while Basich and Prowitt-Smith combined for 18 points with nine points each to pace the victory. Lawrence added 11 rebounds and five assists while Prowitt-Smith had six assists and Kobi Agard (Norwalk) had five setups. A tough stretch of play opening the game’s second half allowed Sacred Heart-Greenwich to open just enough breathing room to hold off the Dragons 47-39 at Coyle Gym on Wednesday. Katherine Marcus (New Canaan) tossed in 18 points for GFA while Georgia Grabowski (Stratford) added 14 points. Kelly van Hoesen (Greenwich) had 13 rebounds while Marcus had seven rebounds and three steals. Grabowski had four boards, three steals and two assists. On a night when the GFA defense played brilliantly, the Dragons’ offense just couldn’t get going as it fell to Cheshire Academy on Friday. Marcus had 17 points for GFA while Grabowski added eight more. Kristiana Modzelewski (Westport) had 13 rebounds for GFA while Marcus and van Hoesen had 12 boards each. Since the creation of the crown, the Wreckers and Dragons have each won one. In an exciting, down-to-the-wire duel, the Dragons were able to edge the Wreckers 42-39. Leading the way for the Dragons were Caleb Seyfried of Westport (106 pounds), Nico Provo of Stratford (113), CJ Shea of Milford (120), Griffin Seyfried of Westport (126), Peter Kane of Fairfield (132) and Jonnie Jackson of Greenwich (182), who all earned pins. Jackson’s pin clinched the match for the Dragons. The Dragons competed over the weekend at the FAA Duals in New Haven. They finished 3-1, losing only to the Brunswick School. GFA defeated the Hopkins School 47-36, Hamden Hall 42-30, Rye Country Day School 60-24 and lost to The Brunswick School 24-56. Four Dragons wrestlers went 4-0 on the day, claiming all-league honors: Caleb Seyfried at 106, Provo at 113, Shea at 120, and Kane at 132. Also earning distinction for his efforts and tremendous FAA career was senior Griffin Seyfried, who will be wrestling next year at the University of Chicago. The Dragons will return to action this weekend in Milburn, N.J. The Dragons kicked off Pack the House Night with a resounding 7-0 win over Staples at the Squash Center. Blake Newcomer (Greenwich), Giani Panariello (Westport), Piero Panariello (Westport), and Patrick Howard (New Canaan) all won with 3-0 victories. Will Sarbinowski (Darien) took a 10-12, 11-6, 11-6, 11-9 win at No. 1 while Will Mackle (New Canaan) posted an 11-5, 11-5, 9-11, 11-8 win. Claire Foley (Southport) battled tough out of the No. 1 slot for GFA before falling 10-12, 6-11, 11-3, 11-7 against FAA power Hopkins on Wednesday. Mary Kessler (Westport), Anya Bettegowda (Wilton) and Annabelle Kreitler (Fairfield) also had competitive games against the Hilltoppers. The Dragons hosted a four-way meet at the Squash Center on Saturday. In the closest match of the day, the Dragons fell to Westover by a 4-3 score. Kreitler earned a three-set win to highlight the Dragons’ loss to Westover. Kreitler earned a 9-11, 11-6, 11-6 win over her opponent. Bettegowda won 11-6, 11-4 and Charlotte Cohen (Westport) won 11-5, 11-4. Against Blair Academy and Rye High School, the Dragons fell by 7-0 scores.